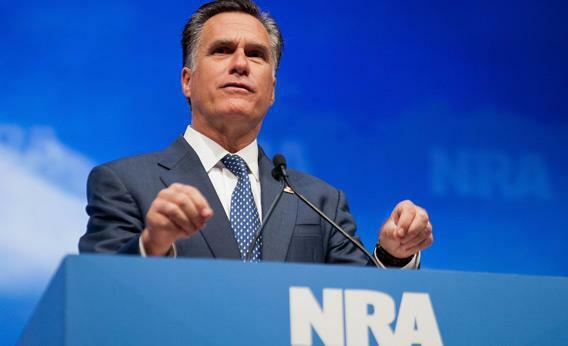 Romney’s NRA Speech: His narrow, selfish, scary definition of freedom. It’s narrow, selfish, ahistorical, and scary. Listening to Mitt Romney’s speech to the NRA last Friday, with its overarching theme of “freedom”—and President Obama’s assault on it—I was drawn to look back to the famous 1941 speech in which President Franklin Roosevelt set forth the “Four Freedoms.” Needless to say, the contrast was stark, and not favorable for Romney. Perhaps it’s unfair to compare a midcampaign speech to a legendary State of the Union address. But it was Romney, now certain of being the nominee—and inside his Etch A Sketch period when he can redefine himself—who chose “freedom” as the reference point. So the comparison was inevitable and maybe even one the Romney camp wanted. FDR’s four freedoms—of speech and expression; to worship as one believes; from want; and from fear—set forth the grand shared view of what Americans sought, desired, expected, and could achieve when government and civil society cooperated. Romney defines freedom in a way that is antithetical to all that FDR believed. Romney’s perspective is so individualistic and devoid of any sense of responsibility for others or a sense of common purpose that I find it hard to believe we have lived through the same crisis over the past several years or the same history since World War II. It is a view of freedom narrowly centered only on the sense that any encroachment by government in our lives is a diminution of freedom—nothing more. Totally absent was the notion that as central to our cause as the ability of individuals to cast off the tethers of others telling us what to do or think is the fact that our accomplishment of grander objectives also requires common purpose and, occasionally shared sacrifice. Our economic freedom is under assault, Romney says. Argument No. 1 for Romney: Our taxes are too high. In fact, taxes as a percentage of GDP are at their lowest in decades. Argument No. 2: Dodd-Frank. Really? The fact that a few banks that got trillions in government bailout funds and loan guarantees might have to change their grossly overleveraged and taxpayer-backstopped business model is a failure of freedom? Romney also cited as evidence of our diminished freedom that we used to be able to build the interstate highway system, but now, he claims, we can’t. First, it is Romney and the Republican leadership who have opposed the large infrastructure projects that President Obama has proposed for fiscal and ideological reasons. It is Romney’s big supporter, New Jersey Gov. Chris Christie, who has unilaterally cancelled a major infrastructure investment that was crucial to the Northeast corridor for craven and base political reasons. The will has been lacking for such projects, not the imagination or fiscal capacity. And that void in will has been within Romney’s own party. Romney also argues that our personal freedom is under assault, and cites the Affordable Care Act, of course. Here is a small story not widely enough known: Mary Brown, who went to court to challenge the bill and whose name was on the litigation that made it all the way to the Supreme Court, claimed at the time she filed the suit, through her attorneys, that she “doesn’t have insurance. She doesn’t want to pay for it. And she doesn’t want the government to tell her she has to have it.” Mary Brown and her husband went bankrupt, leaving behind many debts, including $4,500 in medical bills. She will not pay those bills, but we taxpayers will. That is exactly why the individual mandate was designed, based on the conservative notion that all people should share in covering their own costs and not leave those costs to taxpayers. The Heritage Society, Newt Gingrich, even Mitt Romney all understood this when not in the vortex of a political campaign. I will leave alone the obvious pandering Romney felt obliged to participate in about Second Amendment issues in his speech. Apparently Romney is becoming a more significant hunter as the campaign goes on. But I will ask whether the NRA is still convinced that the Stand Your Ground Laws that it has been so instrumental in passing—the laws that are central to the behavior of George Zimmerman in Florida—really comport with anyone’s idea of freedom. How we define and advance our pursuit of freedom is a central question for American politics. By no means do I feel that FDR’s 71-year-old speech has a monopoly on the answers. But I am equally sure Mitt Romney has yet to grapple with what “freedom” really means and where we have failed over the past decades.